Michael Kanuckel's story creeped me out from the start. It has moments that combine classic VHS movies like McQueen's The Blob and some from John Carpenters The Thing. It does this with minimal characters and locations and uses its uniquely crafted story to conjure up images straight from nightmares. The characters are drawn so well that they are real. Their (and your own) fear becomes truly and horrifically tangible. When you enter this desolate nightmare, it leaves you wanting more. It has one of the best cliff-hangers I have read. The Cinema of Awesomeness Series is really living up to its name. I would say that they all have a B-movie tye of feel to them, what with Hercules totting an arm cannon and people killing and becoming plants in books 3 & 1 respectively, this book comes across in a much creepier tone. Honestly, when I first saw this I was hoping for something along the lines of Night of the Ceeps, Return of the Living Dead, or even Night of the Comet. Those are all incredible B-Movies that just ooze awesomeness and are so unforgettable that you have to stop and watch whenever you see them on. That was not what I got. This had more of a John Carpenter, when John Carpenter was good, kind of film. Honestly, one of my all time favorite horror films is the Thing, and this carries that vibe all the way through. Funny thing is, I didn't even read the book's description until after I had already come to this conclusion, and from what I could see I have to agree that it also has the McQueen Blob vibe. The feeling is hopelessness, desolation, barren, and loss. In other words, the perfect book for a nice weekend listen. I'll be clear, the book is not a downer, in fact it will keep you on the edge of your seat as you listen. It definitely has a mood all unto itself and is a standout in the Cinema series. The writing will grip you, it is vivid, descriptive and full of stomach churning events. This is not one to listen to before bed. Nordman does a decent job, he doesn't quite fit the mood, so to speak, but I couldn't find any faults with his performance. He handles the characters and atmosphere, but I just think he was not meant in this style. It would be kind of like having Morgan Freeman narrate events in the Thing. Amazing voicework, wrong dude to do it. Still, I can't complain about his work as he carried the book very well, and I was creeped out so something must have clicked. As much as I love Candela and Hill, this book really stood out. Maybe becasue it was a touch more grounded. It certainly had a Phantoms vibe going on, and I love that freaking movie to death. This is an excellent addition to the series and a real standout on its own. If you love horror then this is the novel for you. Even though I did receive a promo code for this review it in no way influenced my considerations of the material, and in fact, inspired me to be more honest. Getting a code generally makes me harsher as a reviewer as I am more often concerned what someone like Me will decide based on my review. Black Tar is a story about people in complicated circumstances tackling a very big monster who poses a real threat to their world. Not only do they learn it is they who must do so, they are quite literally the only thing that can stop it. The enormity of that, to be not just worthy but utterly and completely necessary to the survival of everyone one knows despite limitations both known and perceived, is not taken lightly but worn with a mighty weight. This book has impact precisely because it does a great deal more than offer you just another monster vs hero tale, letting you in on the sort of heroic elements that don't get much focus in the big screen version-the sort that mean confronting heartache, love, truth and self-reflection in the very moment when all of these things can dictate some of the most pivotal decisions our heroes face. I've always enjoyed Kanuckel's stuff, I have yet to read anything from him that wasn't a genuine treat to sit down with. His characters, narrative, and open world all mesh together and create a great place to engage with, often a place where one could lose themselves completely. Black Tar is no exception. Come for the adventure and thrills of a great kaiju novel and walk away after completing it with real satisfaction in having come to known such great characters at their greatest moment. Good performance elevates this already great book! 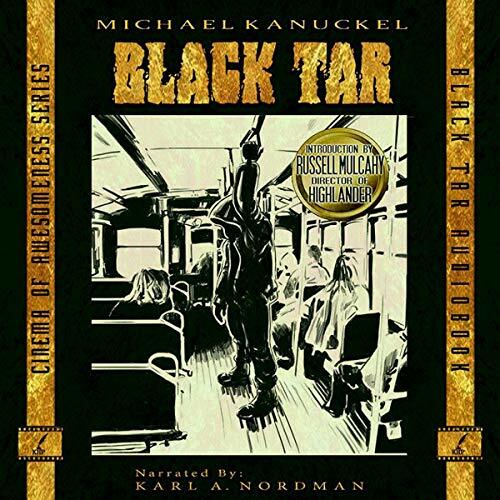 Having previously enjoyed Black Tar in paperback form, I was excited to hear it in audiobook form. The performance was very good, with each character receiving a noticeably clear voice of their own. The story itself is a LOT of fun, with some pretty memorable action scenes and well developed characters. Whether by audiobook or paperback, do yourself a favor and consume this novel! A good mix of sci-fi and horror. The narrator gives all the characters their own personalities and voices. Keeps you hooked until the very end. Definitely need to check out more from this author. Fun read from start to finish! This was like two stories in one. A quick fun audiobook that went right where I wanted it to go! I recommend this to anyone looking for solid writing good characters to take you on a crazy fun filled ride!